By David Hayes on July 30, 2013 . 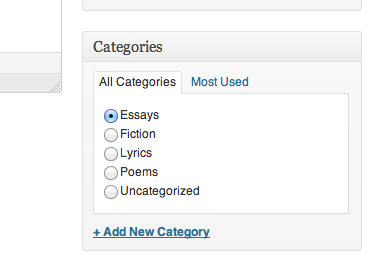 Only One Category is a very simple WordPress plugin to force authors and publisher to only put a post in a single category by swapping out the typical Category checkboxes (which allow many items to be selected), for radio-buttons, which only allow one to be selected. It’s that simple. There’s not much more to say, it’s a simple plugin that does one simple thing in the minimum possible amount of code. We don’t expect to make any big changes to the plugin. But if we have the need, or if there’s some popular demand, we’ve considered making it possible to use it on every hierarchical taxonomy. 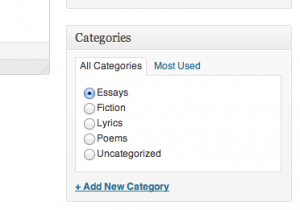 Why use the Only One Category plugin? 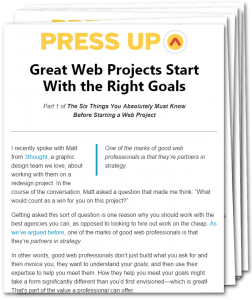 The biggest reason that you might want to use this plugin is that your site is structured around the assumption that posts will exist in a single category. This makes it impossible for a person to accidently break your site’s layout of functionality by putting a post in multiple categories. If you have many contributors and don’t have the resources for a thorough editorial flow with checks and rechecks, the plugin is an easy quick way to make sure your standard is maintained without taking a lot of time correcting mistakes. Only One Category live-swaps the checkboxes which are typically the means of selecting categories out for radio button before the pages are sent to users. We’re certainly open to suggestions. And you can always hire us to make custom changes to any of our plugins. Those changes can be made either exclusively for you, or shared back into the main plugin and given to the community. We’d obviously encourage you to share, but we won’t force your hand if you’re dead-set against it. We understand that there is sometimes a business case for keeping functionality to yourself.